Presentations are essential in business, and if only we had online alternatives to Microsoft Powerpoint then everything would be so much more convenient. There’d be no need to work offline, save and copy from one disk to another, and download impossibly-sized attachments. All we’d ever need is an Internet connection and a browser. Guess what? 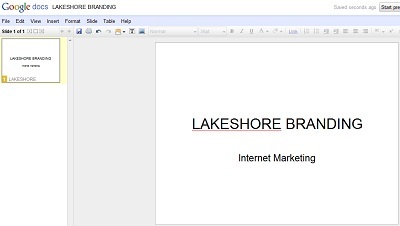 Lakeshore Branding has compiled a list of today’s best online presentation tools and applications. That way, we can take the desktop experience anywhere we go and showcase our fancy presentations on the Web. We’d also have the ability to repurpose old presentations and use them as a way of selling and marketing online instead of in person. 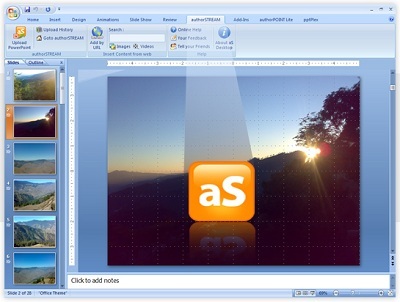 AuthorStream: AuthorStream allows you to do more with your Powerpoint presentations. This tool converts files formatted in Powerpoint into video format, so that you can upload them to popular video hosting services like YouTube and Vimeo. It also works vice versa: if you want to share your presentation to clients and customers, they can easily download it from the site as a video file or just watch it on their browser. Moreover, AuthorStream lets you edit your Powerpoint slides, add videos (from YouTube) to it, and create your own channel in which you can showcase your work. 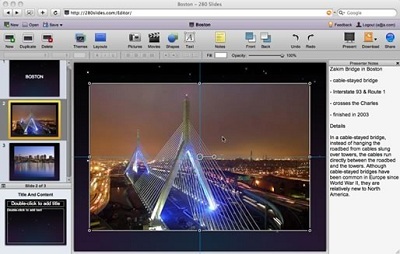 BrinkPad: BrinkPad is a simple Java-based presentation tool for creating presentations and drawings. The tool was created in view of the goal of allowing users to be able to save, manage, and publish presentations and slide shows onto the Web and allow others to view and edit it. One of the best things about it is that there’s no need to install expensive software on your computer: everything’s done online, although BrinkPad still provides users the option of saving files on their desktop. Empressr: Empressr is called “the world’s first free online storytelling tool”, with which you can tell your story and create your presentation any way you like. After adding photos, audio, music, or video to your presentation, you can then have it hosted by Empressr right there and then and choose to share the file publicly or privately. 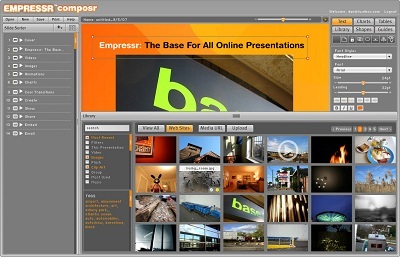 What makes this tool unique is that you can pretty much embed your “Empressr” everywhere: on MySpace, Facebook, Friendster, Blogger, WordPress, etc. Google Docs: Google Docs is one of today’s most popular productivity suites. With this free tool, you can create new presentations from scratch or start from a template. You can even upload your Powerpoint file to Google and work from there. Not only is it a breeze to collaborate and share in real-time using Google Docs; the tool also has a familiar desktop feel that makes editing presentations a piece of cake. 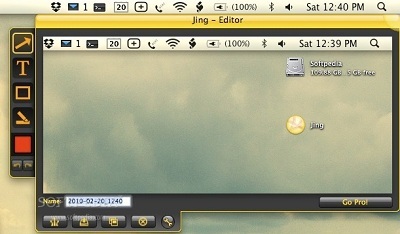 Jing: This free software serves as a screen capture program that enables users to add visuals to their online conversations. Jing’s best feature is that it can capture your screen and the elements on it (slides, webpages, images), record the onscreen action, and add audio while you’re clicking through. You can then share this instantly over the Web, chat, or E-mail. Some people missed your presentation? No worries. With Jing, you can record what actually happened in your presentation (as well as what you said) and E-mail it to those non-attendees. KinetiCast: KinetiCast is a great online presentation application that can host your file and, at the same time, help qualify your prospects. After creating your presentation with KinetiCast, you can then email them as links (no attachments) and gain valuable insight by tracking how many times recipients view your presentation and how much time is spent on each slide. 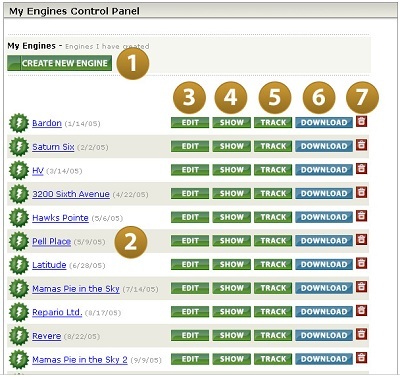 The tool can also track the number of forwards as well as the number of times a link in your presentation was clicked. All these analytical features are awesome, because now you can prioritize your follow-up and customize your sales pitches based on the level of engagement of those who received your presentation. Myplick: Like Slideshare, Myplick is a tool that lets you upload your presentation files and showcase them to the rest of the world. Supported file formats include Powerpoint, PDF, and Open Office, as well as most Microsoft Word, JPEG, GIF, and plain text documents. The great thing about Myplick is that it lets you sync your presentation with audio with a simple click of a button. PresentationEngine.com: This online system allows users to produce stunning multimedia presentations, the kind that you wished you can create with Powerpoint. The people behind Presentation Engine have chosen to focus on larger corporate customers and business professionals, who might have the extra budget to pay for Presentation Engine’s hosted service, professional designs, speedy creations, and stunning-looking presentation templates. Plans start at $47. PreZentit.com: PreZentit is a free presentation tool that lets you create your presentations online. It’s compatible with Internet Explorer, Firefox, and Camino, but any presentation made with PreZentit can be viewed by anyone with any kind of Internet browser. The awesome part about this tool is that it provides you with 250MB of free storage as well as a lot of options for collaboration. Moreover, the presentation slides are generated as web pages, which you can edit manually in HTML if you so choose. 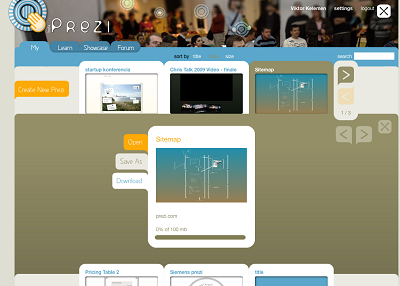 Prezi: Prezi is one of the coolest presentation tools you’ll ever find. Even the New York Times has only great reviews for this awesome zooming presentation editor. Why? Because it rethinks how people make presentations and veers away from the typical linear progression of slide presentations. Instead, Prezi lets users place images, videos, and text on a large canvas – and then zoom in and out of the elements of the presentation. The sizes of these elements are determined according to importance. Created in 2007 by Adam Somlai-Fischer and Peter Halacsy, Prezi hosts your presentation online and allows you to embed it on your website or blog. The free version gives you 100MB worth of space for creating presentations, but premium accounts are also available for Prezi users who need more space and privacy options. 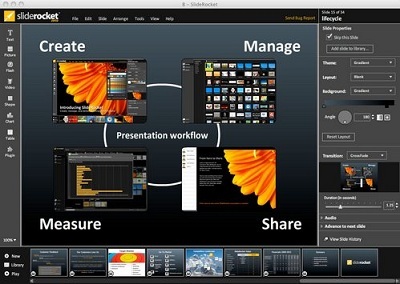 SlideRocket: This web-based presentation software was created in 2006 with the vision of building a better presentation experience. Compatible with Mac, Windows, and Linux, it has a lot of features that help make SlideRocket one of the most powerful presentation tools out there today. These features include presentation analytics, social presentations, an online marketplace for finding multimedia content, and options like the slide audio that lets users easily record audio to slides in a matter of minutes. Slideshare: Slideshare is a popular presentation hosting site that goes by this appropriate slogan: “Present Yourself.” Over 25 million monthly visitors continue to present themselves using this site, and so should you. True enough, this tool has generated a lot of business leads by allowing its users to distribute their presentations to LinkedIn, Facebook, Twitter, and several other social networking sites. While you cannot create new presentations using Slideshare, the tool does let you upload Powerpoint, Keynote, Word, and PDF files – and even add audio to them to come up with your own instant webinar. VCASMO: VCASMO is a multimedia presentation solution for photo-video slideshows and business presentations, complete with features that allow you to work with different kinds of file formats like video, audio, Powerpoint, PDF, and photos. 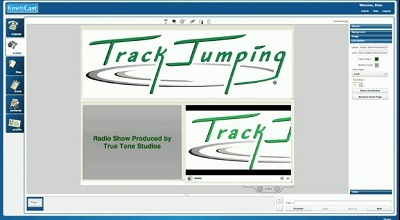 Its two-screen presentation playback is as intuitive as that of any other tool out there, and its friendly editor allows users to arrange slides in a timeline. 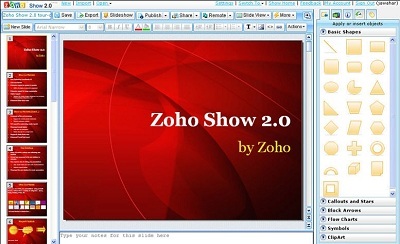 Zoho Show: The Zoho Show (latest version is 2.0) is a powerful online presentation tool for all kinds of users: business professionals, students, teachers, salesmen, etc. 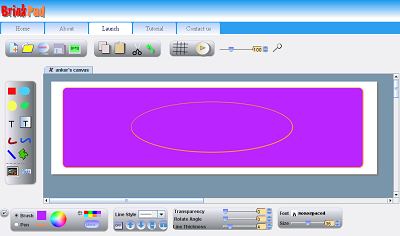 It has pre-built themes, clipart, and shapes coupled with features like drag-and-drop that make everything so easy to use. You can also have a chat going while you’re presenting, making it possible to present from a remote location to a client or customer half a globe away. 280Slides: Like the above browser-based presentation tools, 280Slides lets users insert videos, photos, and audio into their presentation. 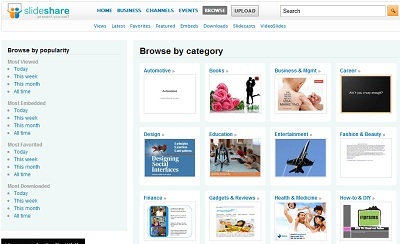 But what sets 280Slides apart is its intuitive interface, which is complemented by a built-in media search feature that lets you import content from sites like Flickr and YouTube. Create a presentation with 280Slides and you can publish them directly to Slideshare, or share them via E-mail, chat, or embedding. There is a new web meeting tool called DOXWOX (http://doxwox.com you may want to check out. 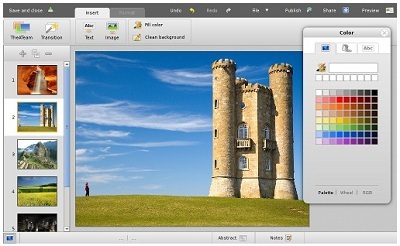 It shares PowerPoint presentations and JPEG and other images in a real time. Very convinient, very straightforward – and also, it’s free. No credit card, no registration needed. Just download a set up file from the website and host your meeting. KnowledgeVision (http://www.knowledgevision.com) certainly deserves more than a mention here — arguably the most powerful and flexible video-and-PowerPoint synchronization platform for creating and managing online presentations. Good source of list of the top online presentation apps. It really helps me a lot, I love the google docs apps. It becomes easy for my client and I to send and receive a top files. I also think prezage.com deserves a shout out.